In a large lidded pan, melt the oil and butter and fry the onions for about 3 minutes. Add the paprika and stir for 30 seconds, add the beef and fry for 3-4 minutes. Add 1/2 cup water, 1/2 the garlic, caraway and salt. Put the lid on, reduce the heat and simmer for 45 minutes stirring regularly. Add water in 1/4 cups if neccessary. Add the capsicum and tomatoes and remaining garlic and cook for a further 30 minutes. Serve hot. Even better the next day. Seive the flour with the salt and pepper into a large bowl. Gently combine the eggs with the milk then add to the flour. Stir well for form a thick batter. Bring a large panful of water to a rolling boil. Hold a large colander over the pan and add some of the batter. With a wooden spoon, push the batter through the holes into the water. When the little spätzle float to the top, let them simmer for 30 seconds then fish them out. Add to a bowl and mix well with the butter or oil to stop them sticking together. Repeat the process with the remaining batter mix. 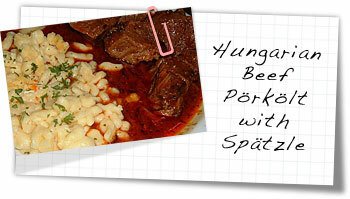 Serve the pörkölt alongside the spätzle. There’s no need for any vegetables – I’m sure the Hungarians don’t even have a word for it.